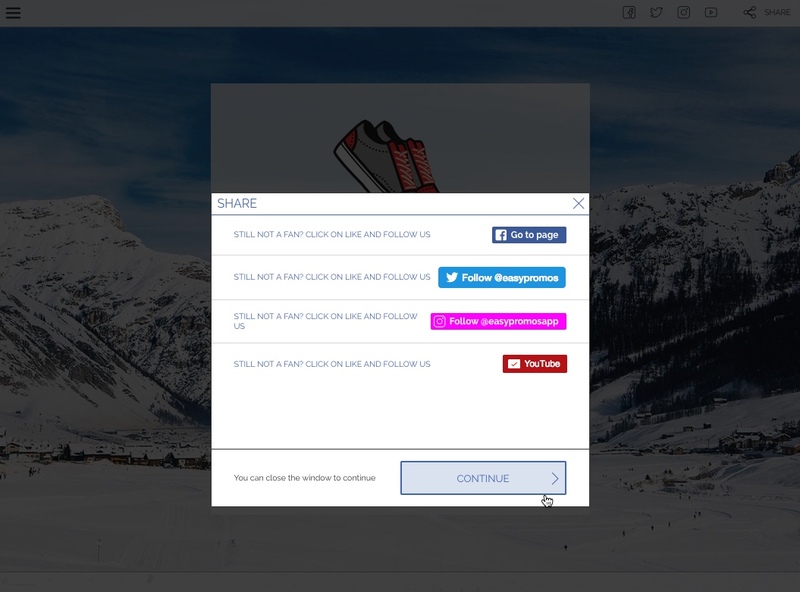 The ‘My Networks’ module enables you to show to participants the social networks of the brand that organizes the promotion with the aim to encourage users to visit and follow your networks. 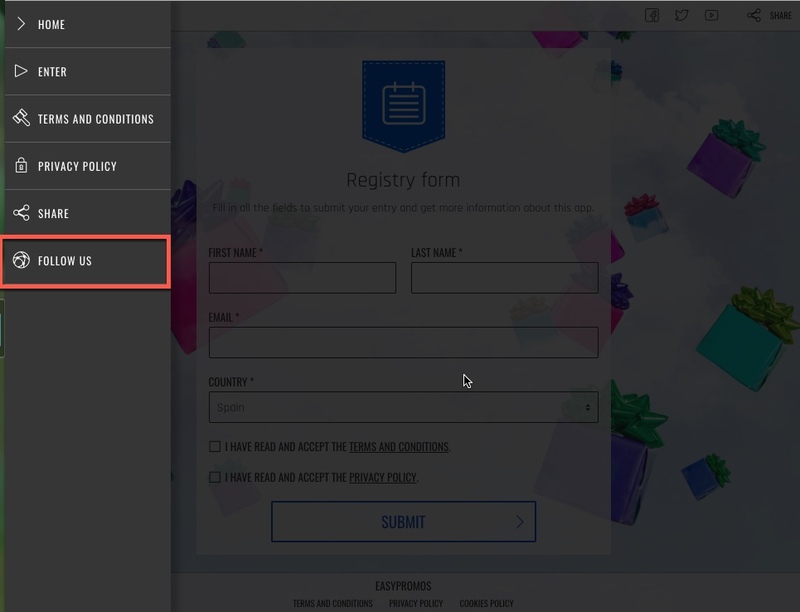 From the administration panel you can fully customize the screen that will be presented to the user during the registration process to the promotion to encourage him to visit the social profiles of the organizing brand and / or other collaborating brands. Where are the brand networks displayed in the promotion? 1. Where are the brand networks displayed in the promotion? Note: The promotion header is only available for promotions created with the Premium design template. 2. In the promotion main menu. You can enable the "Follow us" section in the promotion menu, which will automatically display the "My Networks" window over the promotion. 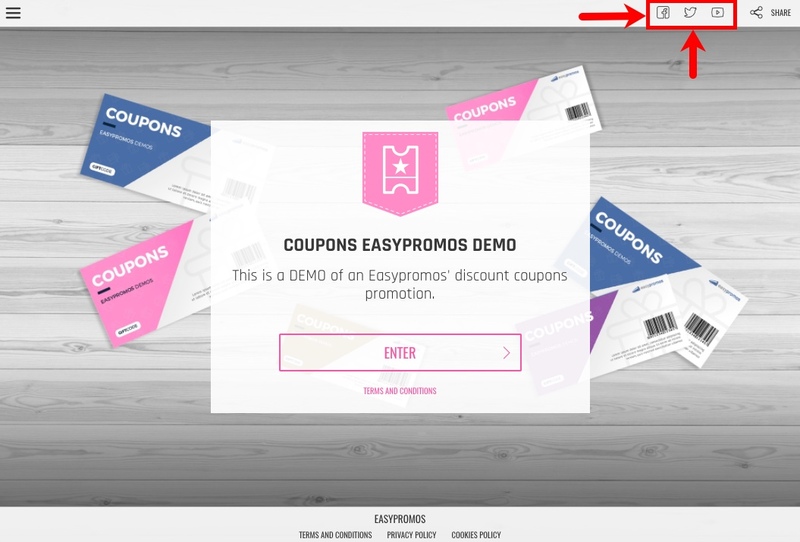 Learn how to customize the promotion main menu. Note: The promotion menu is only available for promotions created with the Premium design template. When loading the Welcome page. 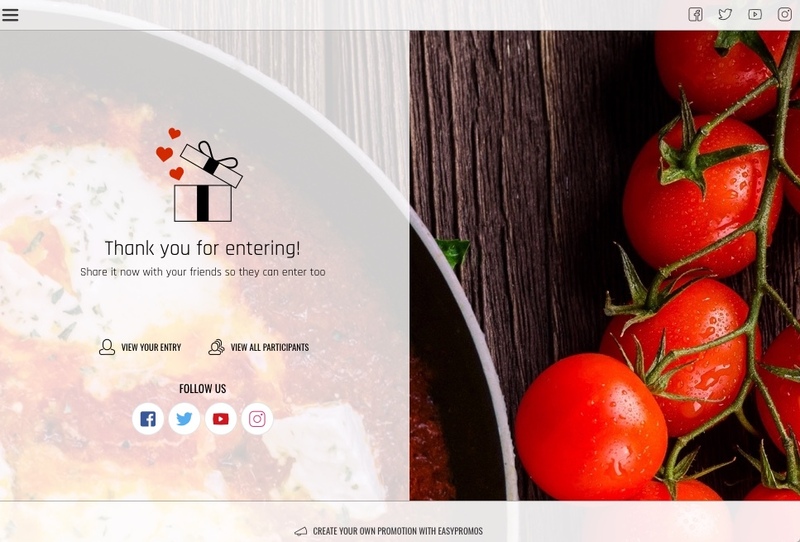 By clicking on the "Participate" button on the Welcome page. By clicking the "Finalize" button on the Entry form. 4. In the promotion Thank you page. If you wish, you also have the possibility to show the buttons of the social networks on the final page of the promotion. 1. Enter the 'Editor of the promotion'. 3. You will directly access the set-up screen of the ‘My Networks’ module. Below, we explain all the configuration and customization options available. The 'My Networks' module can be completely customized with the Facebook pages, Twitter, Instagram or YouTube accounts that you want to suggest the users to follow when participating in the promotion. Title of the window that appears to the user. Description: you can add a small message encouraging users to follow the brand via whichever social network you choose to add. 1) Facebook: By default the "Go to page" button will be added, which works as a direct access to your Facebook page. Text: Message to encourage the user to visit your Facebook page. Go to Page (valid for all Facebook pages with and without restrictions). Like Box (valid only for Facebook pages without restrictions). Like Box with Faces (valid only for Facebook pages without restrictions). Note: In case of selecting the type of button "Like Box" or "Like Box with Faces" keep in mind that it will not be possible to measure if the user clicks or not because Facebook eliminated the option to measure these type of buttons on February 5, 2018. Therefore, the statistics of clicks made on the "like" button can not be included in the statistics of the promotion. You can see the evolution of “likes" on the own statistics of your Facebook page (more information). Text: Message to encourage users to click the ‘Follow’ button and follow your Twitter account. Name of Twitter user: here you should indicate the Twitter account that you want users to follow. To indicate the account you should insert the name of the Twitter user without the ‘@’ sign. Show name of user: you can decide whether you want to show the username of the Twitter account together with the ‘Follow’ button. Big button: you can use the big ‘Follow’ button. Text: Message to encourage users to click the ‘Subscribe’ button of your Youtube channel. Youtube Channel: here you should indicate the channel name or channel ID that you want users to follow. Check Youtube help link to obtain your channel ID. Show user data: you can decide to show the channel logo. Show number of followers: you can also show the number of subscribers. Text: Message to encourage users to click the ‘Follow’ button and follow your Instagram profile. Instagram username: here you should indicate the Instagram account that you want users to follow. To indicate the account you should insert the name of the Instagram user without the ‘@’ sign. On loading the promotion landing page. On Clicking the Submit button in the promotion registration page. 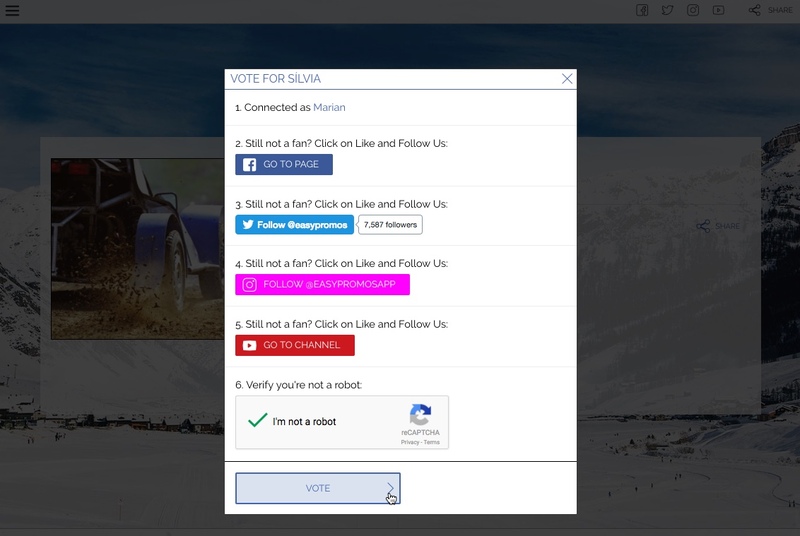 The "My Networks" module can also be displayed to the users who vote in a contest, in order to also suggest to voters that they follow your brand on social networks. In this case, the "My Networks" module will be displayed to voters at the time of voting, in the same window where they are asked to identify themselves. 1. Access the Editor > Pages > Gallery and click on “Votes” tab. From the "Statistics" section of the promotion you can check the statistics of the number of clicks on the different buttons of the social networks configured in the 'My Networks' module. Check this link to learn all the information you can obtain.